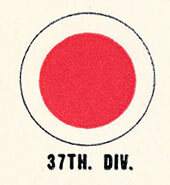 The 37th Infantry Division arrived in the Fiji Islands in June 1942 to fortify the islands against possible invasion. The Division continued its training on the islands. 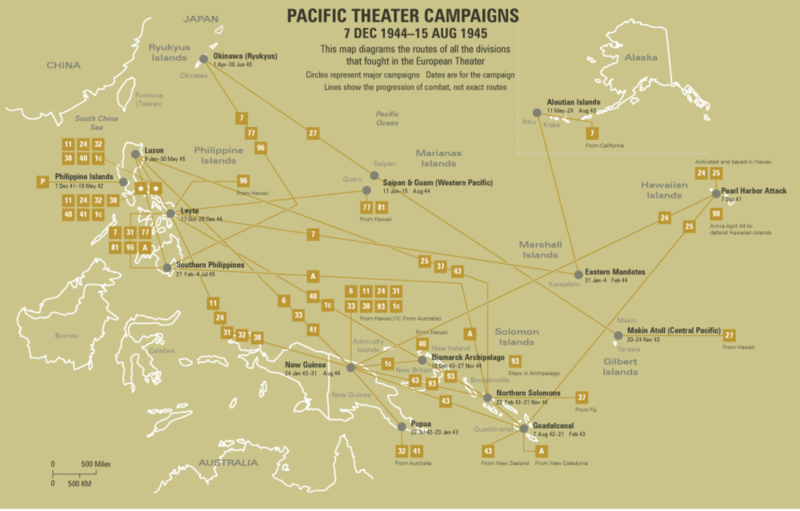 With the end of ground fighting on Guadalcanal, the Division moved to that island in April 1943, continued training, and staged for the Munda campaign. Two battalions joined the Marines on New Georgia, 5 July 1943, while the remainder of the Division landed, 22 July, and assisted the 43d Infantry Division in taking Munda airfield in heavy fighting. After mopping up on New Georgia, the Division returned to Guadalcanal, 9 September 1943, for rest and rehabilitation. The Division's next assignment was Bougainville. Relieving Marine units, 8-19 November 1943, the 37th took over the perimeter defense of the area, constructed roads and bridges and engaged in extensive patrol activity. In March 1944, two Japanese divisions made eight major attacks, but Division lines held. In April patrols cleared the Laruma Valley area of major enemy units. The Division remained on Bougainville and trained for the Luzon campaign. Landing with the Sixth Army on the beaches of Lingayen Gulf, 9 January 1945, the 37th raced inland against slight resistance to Clark Field and Fort Stotsenburg where fierce resistance delayed capture of those objectives until 31 January. The Division continued to drive to Manila against small delaying forces, and entered the city's outskirts, 4 February. Upon crossing the Pasig River, it ran into bitter Japanese opposition, and it took heavy street fighting to clear the city by 3 March 1945. After garrison duty in Manila, 5-26 March, the Division shifted to the hills of Northwest Luzon, where heavy fighting culminated in the capture of Baguio, 26 April. Rest and rehabilitation during May were followed by action in June in the Cagayan Valley against deteriorating Japanese resistance. With the end of hostilities, 15 August, the Division was concerned with the collection and processing of prisoners of war, leaving November 1945 for the States and demobilization.